Reviewing Evelyn Waugh's 1962 novel The End of the Battle, the still-emerging writer Joan Didion argued that American literary history is marked by a hunt for Paradise: "Every real American story begins in innocence and never stops mourning the loss of it," she declared, tracing that motif's history from The Scarlet Letter to The Catcher in the Rye. 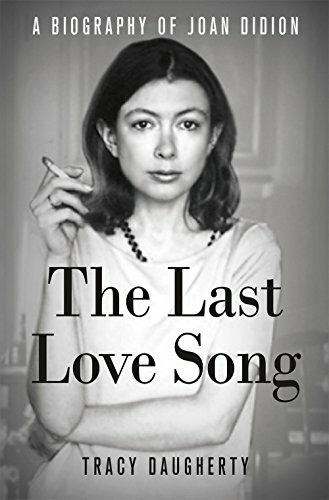 In The Last Love Song, the first Didion biography, Tracy Daugherty suggests that in this early review, we witness Didion "pondering the roots of her literary sensibility." Those same roots are the subject of his book. He starts not with Didion's birth but with a twinned history of her pioneer ancestors and of California, shaping Didion's history into an arc that fits her own mourning for a lost Paradise. Even the casual Didion reader can spot that theme in her writing. I noted it myself, writing in Books & Culture after the 2011 release of Blue Nights that "Didion's writing has always been marked by nostalgia, anxiety, and outright fear—sometimes longing for time gone by, often yearning for a place, frequently seeking or half-remembering something that may never have even existed, a golden age or a myth (like the conception of California that has haunted her)." Daugherty links the lost Paradise motif with three other recurring themes that resonate across Didion's work and life: her love of John Wayne and what he represented to her; her morbid fascination with the Donner Party; and the phrase from the Episcopal liturgy of her youth that tolls, in her mind, like bells signaling doom—"as it was in the beginning, is now and ever shall be, world without end."